Time until Tehkan World Cup release day! Tehkan World Cup, aka. 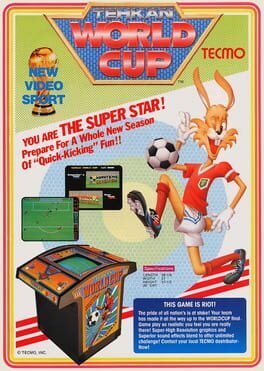 Tecmo Cup, is the first multi-player soccer game featuring a trackball controller. Programmed by Michishito Ishizuka it was released to arcades in 1985 by Tehkan, Ltd., the former name of Tecmo, Inc. Its arrival coincided with the buildup to the 1986 FIFA World Cup. It featured the then colors of several of the world's top teams such as West Germany, Argentina and Brazil, although it did not mention any team by name.